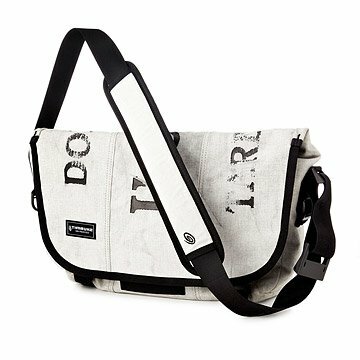 This sturdy messenger bag is made from upcycled USPS mail sacks. This first-class bag delivers on style, function and environmental impact. It's made from durable, reclaimed, hand-selected mail sacks from the US Postal Service. Each sack is unique in both its printed typography and the natural wear from its previous life, making the resulting messenger bags one-of-a-kind creations. The outer flap covers a pocket and zippered pouch, keeping them dry and secure, while a large interior compartment has plenty of room for books, a laptop and more. All of this is stitched to last for the long haul. Made in Vietnam. Due to the upcycled nature of the materials the graphics and worn look of these accessories may vary. Distressing, light fraying, and patch marks (all gathered through years of postal use) add character to this one-of-a-kind bag. Each tote will feature varied block printing from the original sack. I love this messenger bag and the amount of text from the original bags that I was on mine. The only thing that would've topped this was if it has an outer pocket for quick phone access. I was very much looking forward to get this recycled mail bag. It seemed very sturdy, spacious. However mine came with two letters on it. So essentially it got a white bag. Sadly I returned it because it would just look like a dirty bag after a while. But it would have been the perfect bag and durability otherwise. I'm guessing it is the luck of the draw as to how cool of a bag one actually receives. It's a really nice bag. Mine came with USPS and tare weight stencils, but I guess it varies from bag to bag. Super satisfied with this product. It's smaller than I expected, but still plenty big enough to carry my daily stuff. It fits a 13" macbook pro in a neoprene zipper case, but only just. Not sure if it would carry a 15" very comfortably. There's a divider between the laptop section and the rest of the bag. The main area comfortably holds a couple large-format paperbacks, a pair of studio headphones, and a bottle of water. There's some pen pockets inside as well, and some large ones that could probably hold chargers. It looks good and seems plenty durable. When the bag arrived, my daughter - the recipient - was speechless! She had wanted a cool messenger-style bag and this was perfect for her! She loves recycling/upcycling items and she will use this for an overseas trip in the Fall. I use this product to carry textbooks and papers for grad school. It is another solid, high quality product from Timbuk2. Also very unique idea using the old mail bags. My one reservation is that it's quite small. One interior pocket is only large enough to hold an iPad, and the main compartment is only large enough to hold approximately two textbooks. Could use a bit more space. Otherwise great bag. Timbuk 2 makes great bags, you will not be disappointed in their products. The mail bag is a perfect size for everyday use, but is a bit small if you have a larger laptop. The mail bag graphics on my bag were pretty sparse, but I guess that is the luck of the draw. The bag is made out of old mails sacks so be prepared for the bag to look like it is dirty. I think it's cool, but if you are a clean freak you may not.